A product which has been firmly established in Canada, the US and Australia for over thirty years. Because it has a of flexibility and because of the application system it will not creak and groan with temperature change like conventional plastic systems and does not buckle and bow. Royal Cladding exceeds all Canadian, American and Eastern European building standards and has certification from the French Centre Scientifique et Technique du Batiment Technical Judgement, similar to the UK British Board of Agrement Certificate. Because of its unique moisture release system, Vinyl Cladding can be applied in any weather and to almost any surface. Description: Double 4 Designer Panel available in a range of colours. Suitable for caravan cladding .. Description: 5/8" J-Channel available in a range of colours (select from the options) Suitable for c.. Description: 5/8" Outside Corner Post available in a range of colours (select from the options) Suit.. Description: Vinyl Cladding Internal Corner Post .. Description: Vinyl Cladding H Section .. Description: Finish Trim available in a range of colours (select from the options) Suitable for c.. Description: Starter Strip available in white only. Clips together with the designer panel and re.. 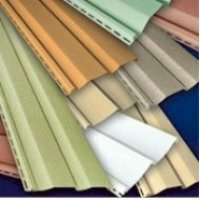 Description: Designer Window Casing available in a range of colours (select from the options) Sui..